The problem with running a one day workshop in altering is the drying time, believe me you do have to plan for this. With an online workshop the problem simply disappears, None of you will be arriving late completely stressed after driving in rush hour traffic for miles on end, having to book the day of work or arrange for babysitters.. You can all work at your own pace and even have a glass of wine along the way! and it opens up the workshop internationally, I am completely converted! You can access the materials list by clicking the Tools and materials tab below the header of this site, the workshop areas are password protected until the workshop starts. 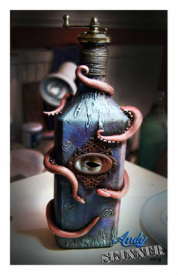 In this workshop you will alter a regular bottle using paints and mediums to produce a one of a kind altered piece of art.